Did you know that you can send SMS text messages from your favourite email platform? Our email to SMS gateway uses a special API (Application Programming Interface) that allows our platform to plug into your current email program (Gmail, Outlook, Firebird, Yahoo etc.) and it will convert that email into an SMS and send it to any mobile number you like. There is no software to download or external plugin to install, our SMS platform will work with your favourite email program and do everything for you. Whether you're using free email programs like Gmail and Yahoo or CRM systems as long as it can send an email our system will integrate with it. If your CRM has auto-alerts or special user triggers like notifications then you can use our API to send out SMS alerts, reminders and notifications as well. You can allow your entire team to use the same account from their personal or work emails. All they need is the account login details for your 160 SMS account and they can use this email to text feature as well. Alternatively, if you don't want to share your login details they can also register on our website with their own login details and you can link their account to your account. This a good solution for temporary staff and keeping login details secure without having to constantly change passwords. Once you send an email out you'll receive a delivery report telling you who received your text message and who didn't. You're not limited to sending out one SMS at a time, you can also send bulk email to SMS messages just include the mobile numbers of the people you wish to send an SMS to, write your message and click ‘send'. One of the benefits of email to SMS messaging is that you can receive replies from people you send an SMS to back to your email address keeping all communications in one place. Alternatively, you can have these messages redirected to your mobile instead. You already know how to use your own email client so there's virtually no learning curve. 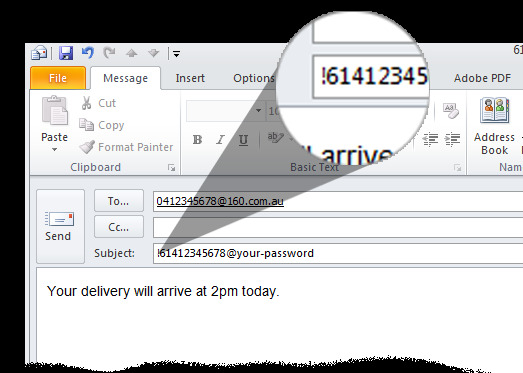 All you need to do is log in to your email client, enter in the recipients mobile number followed by @160.com.au plus enter in your mobile number followed by your account password (see below), write out your message and click send. If you are using this for business purposes then onboarding new team members can be done in minutes. Open up a new message in your email or CRM software. 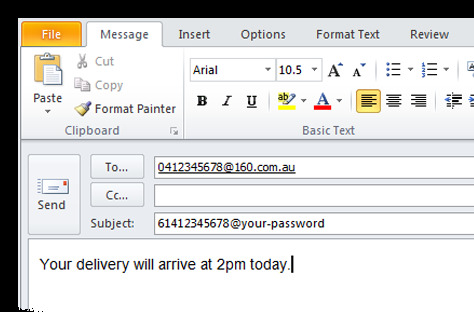 Enter the recipient's mobile number followed by “160.com.au”. Enter your phone number including country code followed by your 160.com.au account password. Type in your message and send. Message: Your delivery will arrive at 2 pm today. If you would like replies sent back to email enter “!” on the subject line. 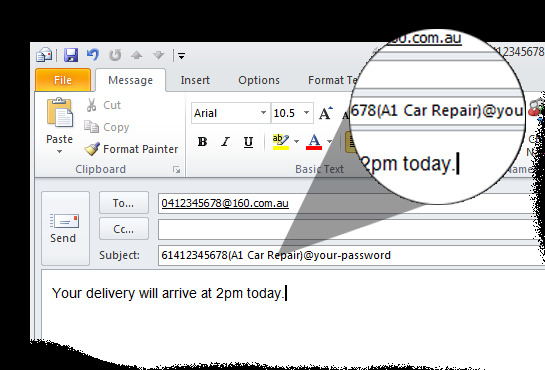 To do this using our Email2SMS service insert a Sender ID that is less than 11 characters in brackets after your phone number in the subject. Thousands of Australians currently rely on 160.com.au's online and email texting platform to reach and connect with friends, family, customers, clients and members both locally and internationally and while everyone uses our service for different reasons it's worth highlighting the main reasons why our customers prefer our email to SMS platform. Highly Secure - We take privacy very seriously which is why we've invested a lot of time and money into keeping our system safe and secure. We don't house any of our data on site, it is kept in a highly secure offsite data centre where we have redundancy processes in place which means if our system goes down you'll never notice it because we have backups that take over. We also have high-grade encryption technology to keep user conversations private. Australian Support - 160.com.au headquarters is based in heart of the Sydney CBD where we handle customer and technical queries from 9 am to 10 pm Sydney time. 100% Delivery Guarantee - While SMS is an incredibly reliable platform, sometimes SMS messages may not get through for example a person may have their phone switched off, or they are out of mobile coverage or they may have changed mobile numbers when they've changed their mobile number. If this happens, our system will keep trying to send the message over 72 hours and if it's still not able to get through the credits are added right back into your account. Credits Never Expire - Once you purchase SMS credits there is no time limit on when you need to use them, these will remain on your account provided you send at least one SMS every 6 months. Easy To Use - We've based our SMS platform on simplicity, it's easy to set up, and it's easy to send out SMS messages - it is designed for people who need a straight-forward method of texting without all of the shiny stuff.